It is almost impossible to buy 50 acres or more in rural Ontario known as "Farm Country" without becoming the owner of a cedar rail fence. 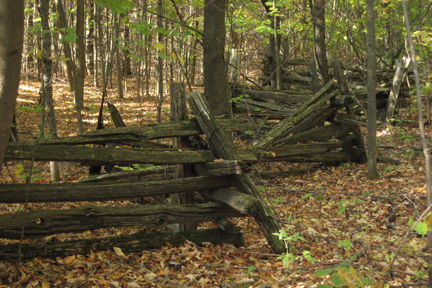 Nor is this kind of fencing seen only in Ontario but throughout North America where farms required sturdy fencing that needed no hardware. These fences, however, were only for the timber rich areas as they required considerably more wood than other types of fences. 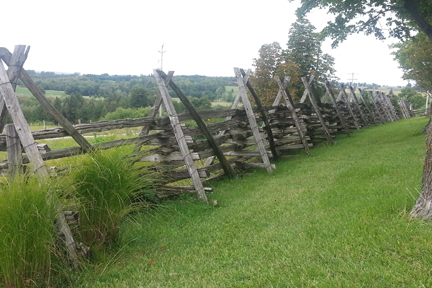 Split rail fences had many advantages for the settlers besides needing no hardware. They required few tools, could be built on almost any type of ground, did not need post holes and were relatively simple to assemble. They could be easily taken apart to repair or move or the wood was more useful for some other project. Rails were made by splitting cedar logs down the middle and then splitting the halves again and then again if the log was sufficiently large. The diameter of the log determined how many rails could be made. Cedar was the wood of choice because it was so plentiful and was rot resistant. In the U.S. chestnut and locust were also used. The zig-zag format was interlocking, easy to make, repair and disassemble. There are several other styles of split rail fences but those not using the zig-zag fashion require additional means of support. Zig-zag fences were also built to have the distance between two zigs or two zags as being 16 1/2 feet which is the equivalent of about 5 metres or 1 rod. By counting the zigs or zags along a side and end of a field, the area could be determined. 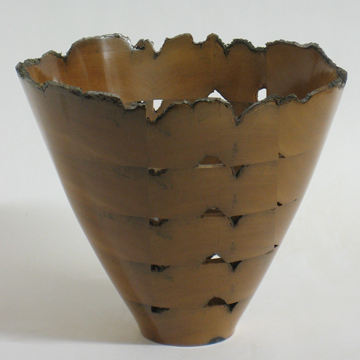 The piece that I have made for "History in the Making" is a shallow bowl with much of the original surface on the rim. (Pictured here on the left.) 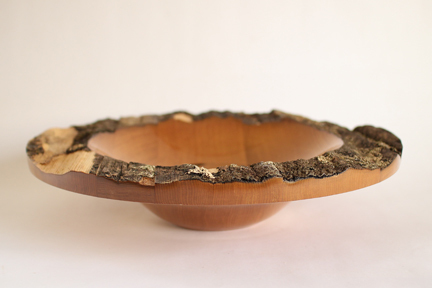 This bowl was not that difficult to make so I am going to show another piece here that was made from the same cedar rail. I was commissioned to make the vase on the far right from the same cedar rail. Making the rings for this piece, especially the top ring, was difficult due to the highly textured surface. For a simplified explanation as to how the concentric ring lamination system works please click here. The key to making the vase was to design it so that the top ring was deeper than each of the other rings. This enabled me to mill enough wood off of the other rings to create glueable surfaces, making a very tricky piece doable. 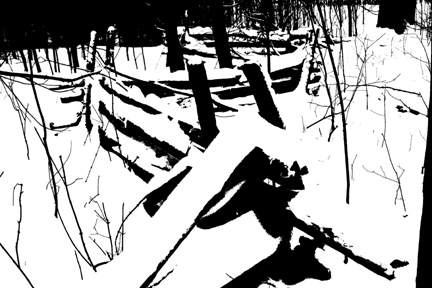 "Fence Line" is for sale. If you are interested, please go to the price page for more information.